A mare or nightmare (Proto-Germanic: *marōn; Old English: mære; Old Norse: mara; German: Nachtmahr; Dutch: nachtmerrie; Swedish: mara; Icelandic: mara; Faroese: mara; Danish: mare; Norwegian: mare/mara; ) is an evil spirit or goblin in Germanic folklore which rides on people's chests while they sleep, bringing on bad dreams (or "nightmares"). The mare is attested as early as in the Norse Ynglinga saga from the 13th century, but the belief itself is likely to be considerably older. As in English, the name appears in the word for "nightmare" in the Nordic languages (e.g. the Swedish word "mardröm" literally meaning mara-dream, the Norwegian word "mareritt" and the Danish "Mareridt", both meaning Mare-ride or the Icelandic word "martröð" meaning mara-dreaming repeatedly). The mare is often similar to the mythical creatures succubus and incubus, and was likely inspired by sleep paralysis. The word "mare" comes (through Middle English mare) from Old English mære, mare, or mere, all feminine nouns. These in turn come from Common Germanic *marōn. 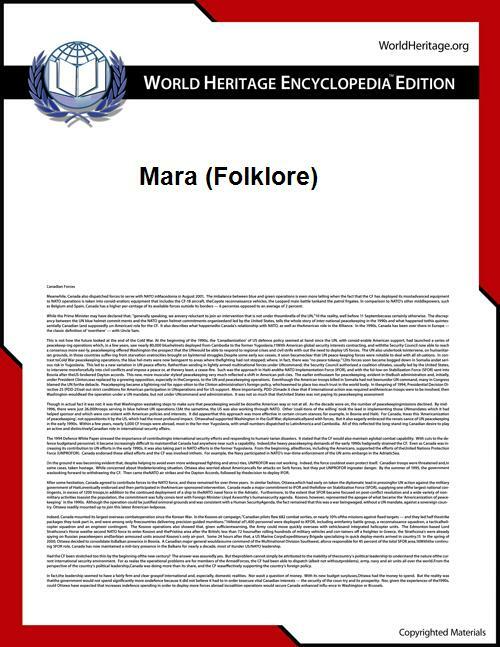 *Marōn is the source of Old Norse mara (from which come Icelandic, Faroese, and Swedish mara, Danish mare and Norwegian mare/mara), Dutch (nacht)merrie, and German Mahr. The -mar in French cauchemar ("nightmare") is borrowed from the Germanic through Old French mare. The word can ultimately be traced back to the reconstructed Proto-Indo-European root *mer-, "to rub away" or "to harm". The mara was also believed to "ride" horses, which left them exhausted and covered in sweat by the morning. She could also entangle the hair of the sleeping man or beast, resulting in "marelocks", called marflätor "mare-braids" or martovor "mare-tangles" in Swedish or marefletter and marelokker in Norwegian. The belief probably originated as an explanation to the Polish plait phenomenon, a hair disease. Even trees could be ridden by the mara, resulting in branches being entangled. The undersized, twisted pine-trees growing on coastal rocks and on wet grounds are known in Sweden as martallar "mare-pines" or in German as Alptraum-Kiefer. According to author and researcher Paul Devereux, mora included witches who took on the form of animals when their spirits went out while they were in trance. Animals such as frogs, cats, horses, hares, dogs, oxen, birds and often bees and wasps. Like other trance practitioners, mora witches traditionally owed their abilities to being born with a caul. In their metamorphosed form they could fly through the night, walk on or hover above water and travel in a sieve. Dead mora witches were said to return as ghosts. In Romania they were known as Moroi. In Slavic countries the terms included mora, zmoras, morava and moroi. Hungarian folklorist Éva Pócs traces the core term back to the Greek word μόρος moros, "death". Another possibility is that the Slavic mora and the Germanic mara come from the same root. In Croatian, "mora" refers to a "nightmare". Mora or Mara is one of the spirits from ancient Slav mythology. Mara was a dark spirit that takes a form of a beautiful woman and then visits men in their dreams, torturing them with desire, and dragging life out of them. Other names were noćnica, "night woman" in Polish, or éjjeljáró, "nightwalker" in Hungarian. In Polish folklore, mora are the souls of living people that leave the body during the night, and are seen as wisps of straw or hair or as moths. In certain Slavic languages, variations of the word mora actually mean moth (such as in Kashubian language "mòra" in Slovak language mora or another example is Czech word můra). In Serbia, a mare is called mora, or noćnik/noćnica ("night creature", masculine and feminine respectively). It is a common belief that mora enters the room through the keyhole, sits on the chest of the sleepers and tries to strangle them (hence moriti, "to torture", "to bother", "to strangle"). To repel moras, children are advised to look at the window or to turn the pillow and make a sign of cross on it (prekrstiti jastuk); in the early 19th century, Vuk Karadžić mentions that people would repel moras by leaving a broom upside down behind the door, or putting their belt on top of their sheets, or saying an elaborate prayer poem before they go to sleep. In Turkey the mare is known as Karabasan. In Estonia the mare-like spirit is called Painaja (presser) or Külmking (cold-shoe). Sleep paralysis, medical term for the condition the mara is thought to cause. Marianne, a 2011 Swedish horror film featuring mara. Borgman, a 2013 Dutch thriller film featuring mares. Hødnebø, Finn and Magerøy, Hallvard (eds.) (1979). Snorres kongesagaer 1, 2nd ed. Gyldendal Norsk Forlag. ISBN 82-05-22184-7. Pickett, Joseph P. et al. (eds.) (2000). ISBN 0-395-82517-2.